All About Konkan: Masalya Pitto/ Phova Masala/ Kumta Masala..
Veggie Utthapa or Mixed veggie dosa my style..
Click Metal - My entry..
Country Captain and Khichuri-Bengal Cuisine..
Masalya Pitto/ Phova Masala/ Kumta Masala.. 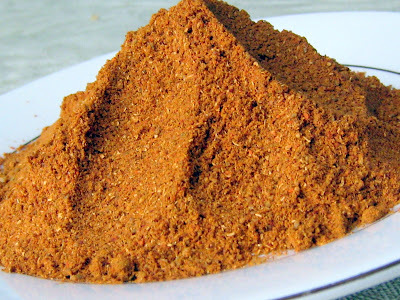 Known by a variety of names and also being used for a variety of dishes, its this masala powder. This is one multi-purpose powder which finds itself in preparation of Poha(Phovu), Chudvo (Mixture), simple or complex bhajis/subjis, mostly used in patal bhaji (means liquid), and even home-made Bhelpuri. Since the masala is so flavorful and stands out all by itself in the dish, we sometimes use it in almost anything, like even upkaris, usalis and dry subjis. As part of the Arusuvai Chain, I sent this powderered masala to Meera of EnjoyIndianFood and Suganya of TastyPalettes and a Kolmbya Pitto ( a Konkani variation of sambar masala ) to Eskay of Meltingpotschow. Am glad that these girls absolutely loved these ingredients. Coz it took me so much time thinking, and making up my mind whether to send this or that and what not. Finally, am glad I sent things which they liked. Meera has already blogged about a Vatana-Batata Patal Bhaji and she has a list which she is going to dish out. So am eagerly waiting to see the delicious recipes dished out by these girls. This masala is readily available in stores in Kumta ( in North Kanara, Karnataka). There is also a very famous Grocery store/Kiraani Dukaan (as we say in konkani) in Karwar (also in North Kanara, near to Kumta), called Damodar Stores, where they make this wonderful masala. They were our neighbours and very good family friends and still are. In our house, this powder is also called D.N.Shanbhag's Masala Pitto, just to distinguish :). My mom still tries and gets it from their store whenever possible. - Dry roast all the ingredients (except chilli powder), one by one. Take care not to burn any of them. Traditionally, we dry them under the sun for sometime. - Then, once cooled, alongwith the chilli powder, grind all the ingredients. - Store in an airtight container and use for different delicacies. The Powder I made in the picture here, I added approx 4 tbsp of chilli powder, so was a little spicy I thought. Nice home made recipe for this Pitto! Sure many of us will get to enjoy it now! I can't thank you enough. Asha too was looking for the recipe. and Srivalli was looking for more information. I told them you are the right person. really, thanks for the recipe. It's simply superb. Maya, the snap is clear here, and I m surely gonna make+store this! Meera aur Tum ho naa recipes ke liye ! ;)He y I always thought fennel seeds are used only by northerners in food! Glad to see your mom using it too! Surely the seeds along wt spices make this more flavourful!